I’ve made my personal position on Halloween very clear in the past. It will be the topic of Monday’s CTT post, too. 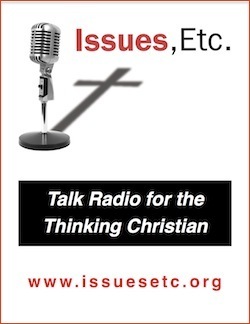 Today, we will be playing an archived segment of Issues Etc, and interview with Pastor Mark Buetow (10/31/2011). In an attempt to temper my anger at the unholiday, I decided to share this viewpoint that actually cuts across my grain. It is not comforting to me, personally, but Pr Mark Buetow does make some solid points here, and I will have to consider these defenses of the Church’s “we were here first” claim to the date. For most, I believe, this interview will be of comfort and blessing. There is no Biblical argument for “All Hallows Eve”… nor is there one against picking a date to remember those who have died in the Faith. I’m resigned to accept that the choosing of dates to have a party, even trying to make them holy observations, falls under Christian Liberty. How one goes about celebrating it though should still be tested Biblically. Each practice and participation needs to be above reproach. 20 Do not, for the sake of food, destroy the work of God. Everything is indeed clean, but it is wrong for anyone to make another stumble by what he eats.21 It is good not to eat meat or drink wine or do anything that causes your brother to stumble. 22 The faith that you have, keep between yourself and God.Blessed is the one who has no reason to pass judgment on himself for what he approves. 23 But whoever has doubts is condemned if he eats, because the eating is not from faith. For whatever does not proceed from faith is sin. Whatever you choose to do for the last weekend in October, take care and walk in a manner that honors Christ. Pray for me, that my anger regarding the pagan “halloween culture” be properly tempered by Grace. October 06, 2015. Today we’ll be taking a look at “The River” by Jordan Feliz which currently sits at #18 on the 20theCountdownMagazine. Overall, this song has a very catchy rhythm and melody. The song has a Monet quality to it in that there seems to be a decent theme to the song when viewed from a distance, but it loses clarity in the details when observed up close. In trying to unpack the theology driving the song, I got confused, which is typically a red-flag for emergent or progressive “christianity”. Let’s check out the song. The high-altitude view of the song displays a general theme of repentance pointing to the imagery of baptism (going down to the River). However, the connection of the River to baptism doesn’t stay consistent throughout the song. So that forces us to look more closely to the details, and that’s where we hit some snags. Who is the target audience? The song lyrics don’t make it clear to whom the song is being sung. If the song is being sung to unbelievers in need of faith, repentance, and baptism… then why not just stick with the imagery of the new birth in the baptism? If the song is a call to Christians to repent and be forgiven, why is the reference to baptism something that lies ahead of the singer and audience rather than a reminder of your baptism? Since this is a new song from a new artist, I thought I’d check to see if there is any context provided. The best example of his singular vision is the record’s powerhouse first single, “The River.” While it sounds like a pulse-quickening mega-hit from the first listen–instantly singable and repeatedly listenable– the song actually rides on a deep current of soul-driven funk influence that serves to set it apart from other contemporary radio fare. Okay, so his intended audience is everyone. He’s using the imagery of the River as a catch-all for baptism of a new believer AND repentance and forgiveness for the already baptized. Also, we see some strong emergent language in the “whether they’re stuck in pride and legalism or whatever” comment. We’ll have to keep an eye on this guy. If you’d like to read more about him, simply follow the link. Verse 1: Here we see an introduction to the idea that there is a place we can go to be made clean. This is true. The blood of Jesus Christ, shed at the cross washes us clean by God’s grace through faith. But this isn’t so much a place we can go as it is a point of faith. Some excellent passages we can look to for this wording of washing away of sin can be found in Psalm 51 and Isaiah 1. What is important to note with these passages, is that neither one is a call to the unbeliever. In Psalm 51, David is chosen of God, but he has sinned before God and is repenting. In Isaiah, the Prophet of the LORD is speaking to rebel Judah, His chosen people who have sinned against Him. I mention this because many take these passages as proof-texts for decisional regeneration. For the unbeliever to come to faith, the Holy Spirit must open his eyes and ears to the Truth of the Gospel of Jesus Christ. We aren’t born alive and merely struggling with sin, we are born dead in sins and trespasses. We need to be regenerated by the Spirit of the Living God in order for us to make the confession of faith. Pre-chorus: This pre-chorus can be describing the working of the Holy Spirit, drawing individuals to the knowledge of Christ, and convicting believers of their sin so that they might repent and be forgiven. Unfortunately, it also describes the emotional manipulation that is performed in many a seeker-sensitive service to compel people to “come down to the front to make a decision for Jesus today“. It’s a popular pattern/technique. Once the preacher is finished giving life-tips, he give a queue to the worship band to start playing some slow, emotive “worship” music in the background, as the speaker makes a decisional sales-pitch to any who “don’t know Jesus as their personal savior” or “have not yet asked Jesus into their hearts“. As the music swells in the background, the speaker will give the audience time to give an indication of their willingness to “give Jesus their heart”… Maybe even include a call for those who’d like to “re-dedicate their lives to the LORD” to come to the front. This serves a dual purpose, it allows the speaker to get the sense that their words bore fruit (people walking forward) and it gives others room to follow the commands without clearly identifying which group they are in, so no one needs to know this is their first time of “giving their hearts to Jesus” until they are ready to say so. None of this is Scriptural. This is an emotional technique that works in any environment where group psychology and dynamics is at play. Cults do it, Fraternities do it, workforce seminars, etc. They do it because it works. We are emotional beings, and our emotions are easily worked once we’ve established a common ground. The point being that this pre-chorus is only as good as your doctrine. Chorus: So, we are going down to the river to pray? In the seeker model of church service, there are lots of altar calls for many reasons. The goal is simply to get folks to fill up the front of the church for an emotional experience and prayer. Most of the time the intention is good, but misguided due to an over-emphasis on emotional experience and not enough focus on Scripture. Faith comes by hearing and hearing by the Word of Christ (Romans 10:17); it doesn’t say “faith comes by weeping and wailing at the front of the church”. Please understand that I’m not saying that weeping (I tend to weep), wailing, or even coming to the front of the church is a bad thing. I’m saying the hyper-focus on emotional experiences is a bad thing. I’m also fed up with the emotional manipulation techniques… don’t whip people up into an emotional mess, preach the Word. Verse 2: Okay, this is where things get a little odd for me. We are not yet in Paradise, we still walk this earth in sinful tents of flesh. There is a continual need for those who are of the household of faith to confess, repent, and be forgiven of sin. We are not yet perfect. The singer is pointing to his own experience as authoritative for the listener (I’ve seen it move in my own life). If everything else the message is solid, this might be considered a minor point… but the whole song has me a bit confused so I have to present this as problem on equal footing. Emergents don’t hold a high-view of Scripture, they lean on experience and personal understanding for their theology. Jordan can’t point to himself and then say he’s been taken into paradise. He hasn’t been, he’s still on this earth, and if he has Faith, then he is a sojourner in this fallen world. If he lacks faith, he is very much still a part of this world. Dear Christian, don’t point to yourselves and don’t get cute with offering exaggerated promises or benefits of being a Christian… point to Christ always, and testify of your faith in Him. I think it is worth mentioning that attempting to provide a corrective mechanism for enjoying this song needs to be done differently for Creedal Baptists, Presbyterians, and Lutherans. I don’t like splicing up the denominations in DiM posts, but where Baptism is concerned I think it bears mentioning. Rather than try to speak as an authority for each of these doctrinal positions, I am simply going to share what Scripture says and leave the doctrinal discussion for you and your Pastor. We’ll start with the Great Commission and move on to the Apostolic writings. Again, these should be taken to your pastor if you have any questions regarding them. Therefore, as you received Christ Jesus the Lord, so walk in him, rooted and built up in him and established in the faith, just as you were taught, abounding in thanksgiving. See to it that no one takes you captive by philosophy and empty deceit, according to human tradition, according to the elemental spirits of the world, and not according to Christ. For in him the whole fullness of deity dwells bodily,and you have been filled in him, who is the head of all rule and authority. In him also you were circumcised with a circumcision made without hands, by putting off the body of the flesh, by the circumcision of Christ, having been buried with him in baptism, in which you were also raised with him through faith in the powerful working of God, who raised him from the dead. And you, who were dead in your trespasses and the uncircumcision of your flesh, God made alive together with him, having forgiven us all our trespasses, by canceling the record of debt that stood against us with its legal demands. This he set aside, nailing it to the cross. He disarmed the rulers and authorities and put them to open shame, by triumphing over them in him. These are the clear passages that teach on Baptism. Your doctrine of baptism will greatly affect your take on some of the lines of today’s song. I’m not happy with the song. It is muddled and confused. How bad or salvageable the song is will depend greatly on your doctrine/confession of Salvation, Faith, Regeneration, Justification, Sanctification and Baptism. I don’t think the song can be fully salvaged for any of the orthodox doctrines. I suspect the artist is heavily seeker-sensitive / emergent and cannot recommend him to anyone at this time. Our sermon today is not a sermon. I reviewed 5 sermons this week that were good, but didn’t seem to hit the notes I felt were most important for this week. Yesterday’s DiM post was a discerning look at the role of music and Worship in the Church, from pastors who come from various reformed traditions. I attend a reformed Baptist church now, but I wanted to find something that could present a bit of a juxtaposition of Lutheran and Reformed theology. I believe this discussion does a good job of that. 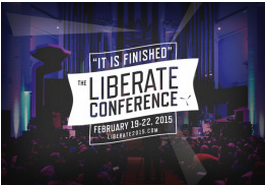 We’ve listened to lectures from this year’s Liberate conference, and today we’ll be looking at a discussion between a respected Reformed Pastor Steve Brown and Lutheran Dr. Rod Rosenbladt. They had not met previously, but knew of each other by common friends and associates. Here, we have a wonderful opportunity to see the subject of Absolution and the Forgiveness of Sins, the Gospel of Grace, discussed from both the Reformed and Lutheran perspectives. There are difference, yes, but there is also common ground that is worth highlighting, that being the Gospel of Grace. *note: At one point in this discussion (16:15), Steve Brown reflects on his encounter with Nadia Bolz-Weber, an ELCA Lutheran pastrix. While I do appreciate Steve Brown’s intention of using this anecdote to highlight the diversity of believers and the power of Grace, I don’t want anyone to come away from this thinking she is doctrinally sound or that she rightfully holds a position of pastor. She is not, and does not, and I pray she repents. She is still loved and cared for by many in the LIBERATE community. She is to the Lutheran community what Rob Bell was to the Southern Baptists, deconstructing Doctrine and minimizing sin ala the Emergent/Liberal Church. We have family visiting us today through this weekend. I have fallen behind in blog post drafts, so today’s post will be a link to a powerful lecture given by Dr. Rod Rosenbladt at Faith Lutheran Church in Capistrano Beach, CA on November 7, 2010 entitled, “The Gospel for Those Broken by the Church“. Dr. Rod Rosenbladt is professor of theology and apologetics at Concordia University (Irvine, California) and co-host of The White Horse Inn radio broadcast. He is a Lutheran Pastor. In this lecture, he will give some Church history for both Lutheran and Reformed traditions as well as address the Wesleyan, Armenian, and Nazarene. The focus of this lecture is on the need for Christians to be focused on, defined by, and preaching fully the Gospel of Jesus Christ for Christians, too. Looking beyond the differing Denominational frameworks to the Cross of Jesus Christ. This is an essential lecture for all Christians, regardless of denomination. Please do not simply forward this video to those you know have been hurt by the Church, without first digesting it, reviewing it, and understanding what is being presented so that you can reach out in love to the individual with whom you wanted to share. By the sad alumni of the Christian faith, I mean the hundreds and hundreds whose acquaintance with the Christian church was often one in which they were helped to move from unbelief (or from a suffocating moralism) into real saving faith in Jesus Christ. They heard the preaching of God’s law and then heard the announcement of Christ’s work on their behalf on the cross—Jesus as the God-man who met the law’s demands for them, and died for their sin, died to save them, died to give them eternal life. They heard the wonderful message of God’s grace in the cross and death of Jesus Christ. They heard the astonishing news that God in Jesus Christ died for them, died so that they can be—and are!—freely forgiven based solely on that atoning death. They heard that Christ’s blood redeems sinners, buys us out of our self-chosen enslavement. They came to believe that Christianity is not so much about what is in our hearts as much as it is about what is in God’s heart—and this proven by Christ’s vicarious and atoning death for them, for their sin. They came to believe that the cross of Christ was their salvation. For free. And forever. It is not all that uncommon. I find that these angry ones have usually not switched from Christianity to another religion. Nor have I found that they have switched from one Christian denomination to another. Instead, I find that they are angry at any and all religions and anyone who represents any religious position—but especially Christianity. And that is natural. After all, it was Christianity, as they see it, that “used them up and threw them away.” I suppose the most visible examples would be men like the late comedian Sam Kinison and ex-Roman Catholic George Carlin. You may (and probably do) know better contemporary examples than I know. All of us are in the vicinity of people like this at one time or another, maybe know a few of them as friends, or have at least met one or two in passing. Why do I say that? Because such people are, as I said, not all that uncommon these days. Now I certainly can’t this evening exhaust the dynamic involved in such people (again, I’m no clinical psychologist). But I still think a lot of the mad alumni also often have a nameable history, just as the sad alumni have one. People like this often speak as if Christianity baited and switched them—just like a used car salesman “baits and switches” a young couple at a car lot. Be blessed today, and come back tomorrow for another Friday Sermon here at FaithfulStewardship. Today we are going to try a different approach to “Discernment in Music” (DiM) day here at Faithful Stewardship (2 Corinthians 10:4-6 (ESV)). On Tuesdays, we look at what is currently popular on Christian Radio top 20 charts. I wanted to introduce my readers to a song and a music artist of whom you may not be familiar. Writing music is no simple task. There is a great deal of hard work and creativity at work in the writing, composing, and producing a song. Tougher still is the task of writing a Gospel-centered, God-honoring song lyric that is well-produced and gains airplay. We spend much of our time here in our DiM posts pointing out the vagueness and even questionable theology that is found in the messaging of popular “Christian” music, and I must admit that it can become discouraging. Especially when a favorite song turns out to be void of lyrical meaning. We try our best to rescue a popular song with proper Biblical understanding; however, some songs are simply meaningless and unrecoverable. For our first DiM of this type, I wanted to challenge myself by choosing an art form of which I am not particularly a fan… rap. Clearly, this is a rough genre for me since I was completely unaware of Lecrae’s collaboration with For King and Country, much less did I anticipate them winning a Grammy for it. Today, we’ll be taking a look at Jovan Mackenzy. He’s been a rap artist for several years and I became aware of his work via Fighting for the Faith. I decided to review the title track for his latest album “All Hail”. They don’t know about post mil. What’s that under His feet? And the meek Jesus said that the Earth they shall inherit. Jesus the Messiah brought the expected kingdom on time and as planned. He is seated and reigning now. His kingdom will grow in history through the preaching of the Gospel and in the power of the Holy Spirit. The world will experience the transformational blessing that peace with God brings. Jesus will return for the resurrection of the just and the unjust after… after… all His enemies are put under His feet in victory. The last enemy is death. Publishing: © 2014 JovanMackenzy.com. All Rights Reserved. While in a previous post I lamented the poetic, faddish phrasing used in most Rap lyrics and how it doesn’t lend itself well to clear messaging, Jovan Mackenzy has packed a lot of theology into this song. You might disagree with some of the statements made, but you can’t claim to be unaware of his position. That’s very refreshing. Jovan even managed to work in some scripture references into the lyrics which makes some of my work even easier. So let’s work through the song from top to bottom, paying special attention to the passages referenced overtly. Amillennial Theology. Okay, so I’m listing this as a positive element, not so much because I fully agree with the amillenial eschatology; rather, because Jovan is being clear where he stands in the very first verse. Amillenialism is the view that the “1,000 year reign” referenced in Revelation 20 is not a literal 1,000 years but a picture of completion. That Christ’s reign began at His resurrection and that His Kingdom is the Church of whom He is the Head. When the fullness of time is completed (10^3 = 1,000), Christ will return once and for all to judge the living and the dead. That’s the amillenial interpretation of Revelation 20, and it is generally the view held by Lutherans. Jovan Mackenzy is a Lutheran. Understanding this view is important for understanding a couple of lines in the second verse and helps to understand the chorus, though we’ll see in our concerns that some of the lines might also be confused with Dominionism (of the New Apostolic Reformation sort). Edit 8/11/2015: I made some poor assumptions here. Jovan Mackenzy is neither Lutheran nor does he hold to amillennialism. Chorus. The message of the Chorus is that Jesus reigns… specifically as the King over all Creation. He is sovereign over all things, even the pagans, and He is coming back. Verse 1. The atonement, the mercy seat, the deity of Christ is all proclaimed in this verse. Tightly packed and filled with theology. It is interesting that Jovan chooses to reference the scriptural declaration of Christ as both the One born in Bethlehem and from ancient days (Micah 5:2). Verse 2. The second verse opens with a summary who we are in Christ as declared in Ephesians 2. What I find cool here is that Jovan isn’t just offering a summary, He’s challenging the listener to read the whole chapter. That’s awesome, because that chapter is an excellent summary of Law and Gospel. We did a Gospel Wednesday overview a while back where we looked at the overall message Paul wrote in the first 3 chapters of his letter. In the middle of this verse, there is some slang that references “this post is real” and “this post mil”. I believe Jovan is referring to Heaven, Eternal Life, in the post-millennial reign of Christ through His Church. If you are a pre- or post-millennialist, Jovan is referring to the eternal life that happens after the final return of Christ. Jovan is calling out those who have rejected the literal return of Christ as those who don’t believe in the “post mil”. This portion also dives into a pop-culture reference that I had to look up to understand. I don’t follow basketball. So, if you are in the dark about who Carmelo Anthony is, or that he played High School basketball at Oak Hill Academy, you are not alone. At least now you know. Incidentally, he plays for the NY Knicks. Verse 3. Here we get 2 references to Scripture. Jovan is focused on the millennial reign of Christ in His Church and is calling out those whose theology allows them to coast as “saved Christians” waiting until the literal reign to work in the Kingdom of God. Let’s look at Psalms 2. Jovan is not preaching Dominionism, he’s preaching amillennialism. This passage isn’t about the Church’s reign; rather, it is about Christ’s reign over His Church. A Church comprising of all peoples and all nations to the ends of the Earth. The kings of the world who persecute the Church do so at their own eternal demise. He who sits in the heavens laughs; the Lord holds them in derision. When Christ Returns for His Church, it will be too late… judgement is coming. We dare not treat the Gospel of Jesus Christ as a ticket that was punched a long time ago that assures us entrance into God’s Kingdom. We are to serve the Lord with fear, and rejoice with trembling. Kiss the son and take refuge in Him, lest He be angry and we perish in the way. The next reference is to Psalm 72:11. I highly recommend reading the full Psalm 71, but we’ll look at the immediate context of this verse. The last portion sounds like the audio from a sermon. I couldn’t find the sermon myself based on the words spoken, so if you know please share in the comments below. The poor enunciation of “all hail” bothers me. Every time the chorus is repeated my ears catch “awe hell” instead of “all hail”… and that’s a problem. Couple that with the fact that the line is repeated 8 times at then end of the chorus, it’s almost enough to make me quit on the song. Because I know this is the title track for the album and the album cover very clearly says “All Hail” and the immediate context of “King Jesus” makes it overwhelmingly clear that he’s saying “all hail”… still my ears get confused. Theologically, there is the risk of people coming to the wrong conclusion that “All Hail” is preaching Dominionism (the idea that its the Church’s responsibility to subject the nations of the world under Christ’s feet). I’m not sure there is any clear way to avoid this confusion, and it’s a minor concern given how much clear theology is conveyed in this song. While I am no fan of rap music, this song sets a very high lyrical bar. It’s clear in its declaration of Jesus Christ as our Savior, King, and Creator. I couldn’t ask for a clearer message in a song. I wish we had more of this effort of pouring theology into popular musical forms on our Christian airwaves. ps – Jovan has an older video on his youtube channel where he explains the Gospel. Check it out here.